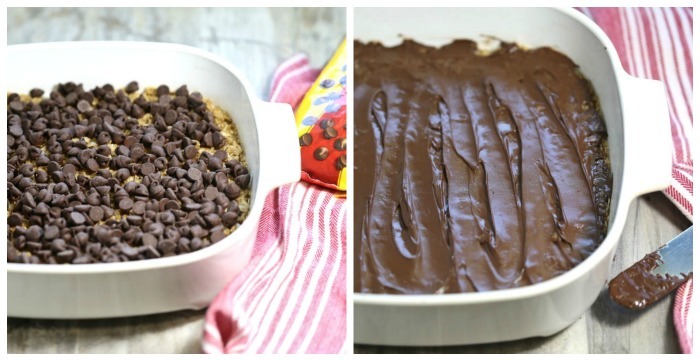 These microwave oatmeal bars could not be easier to make. They have just 6 ingredients and are made in the microwave in just minutes. Summer is upon us and the last thing I want to do is heat up my kitchen by using the oven. But we still like the taste of a great bar recipe. This is where this recipe comes in handy. There is no baking and all the heating is done in the microwave, from making the crumble crust, to melting the chocolate on the top. 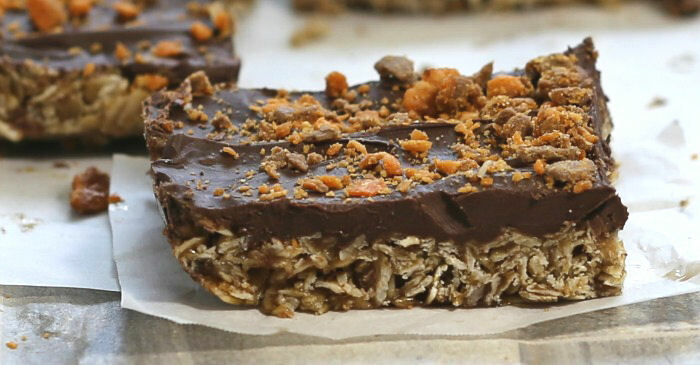 Easy desserts like this (and my no bake chocolate peanut butter oatmeal bars,) are my cup of tea. The whole recipe takes less than 10 minutes to make and then the bars sit in the fridge to set while you get on with your day. You can even make them early in the morning, go to work and come back to a delicious dessert that the family will love. Never made microwave desserts? Don’t worry, this recipe will show that the microwave is made for more than just reheating foods! 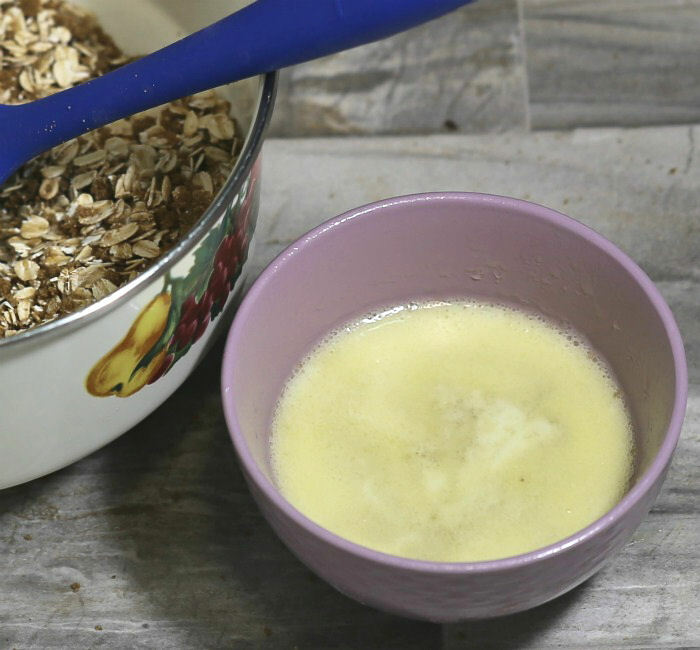 Start by combining the oats and brown sugar in a bowl and mix well. Don’t worry if there are clumps of the brown sugar. They will melt in the microwave. Melt the butter in the microwave for 1 minute. Use some of the melted butter to grease a 9″ microwave pan and set it aside. Add the rest of the butter and the corn syrup to the oats and brown sugar mixture. Mix it well. It will be quite sticky. 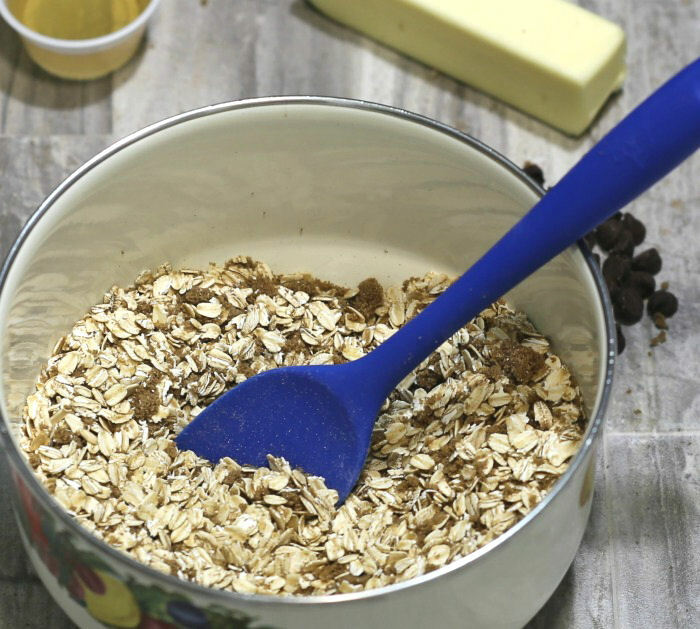 Sprinkle the chocolate chips over the top of the oatmeal base and heat on 30% power for 4 1/2 minutes. The chocolate will not look completely melted at this stage but will be very soft. Spread the chocolate over the base evenly. Finish up by sprinkling the microwave oatmeal bars with the Butterscotch baking bits while the chocolate is still soft. Place in the fridge for an hour to allow the chocolate to set and the base to firm up before cutting into squares. 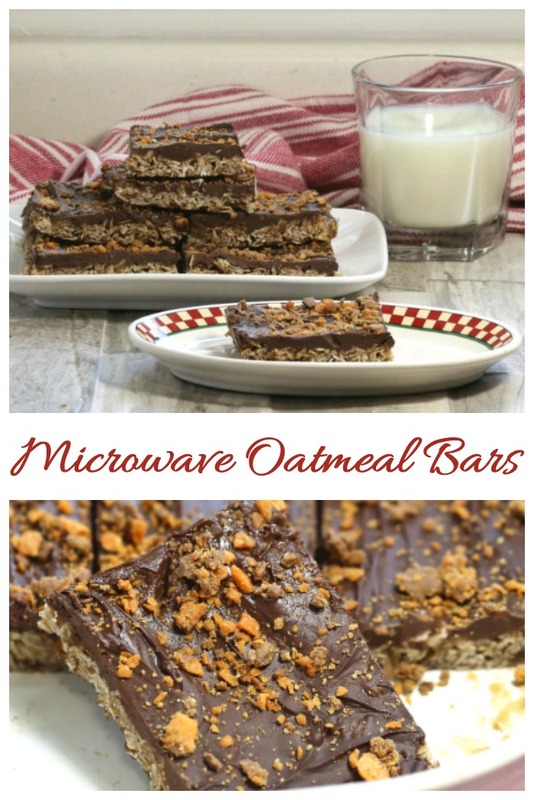 These yummy microwave oatmeal bars are chewy and rich with a crunchy topping. The base holds up well and the dark chocolate gives a smooth finish to every bite. 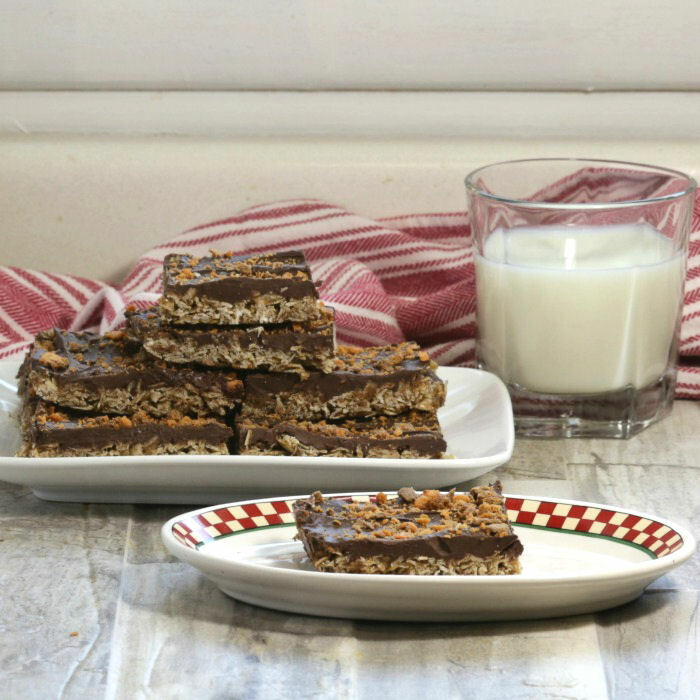 The bars have a kind of homemade chewy granola bar texture with a scrumptious sweet crunchy surprise on top. 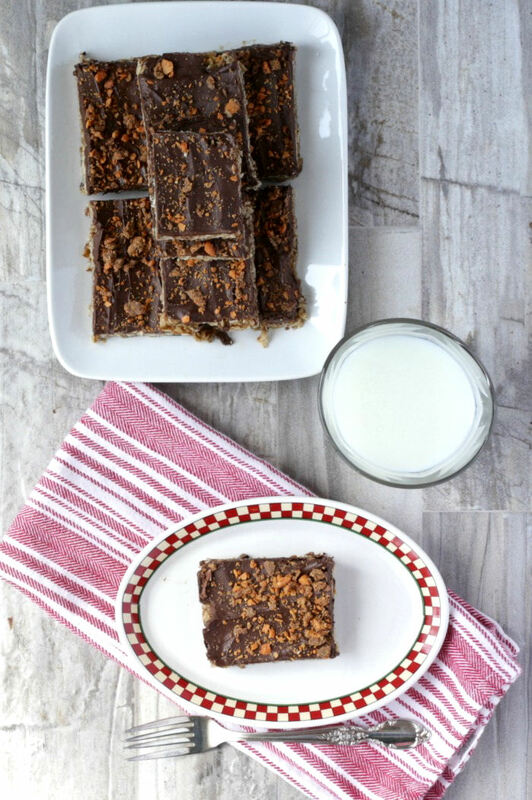 If you need an easy dessert to take to a pot luck dinner or bake sale, try these chocolate oatmeal bars. They could not be easier to make but still taste amazing. 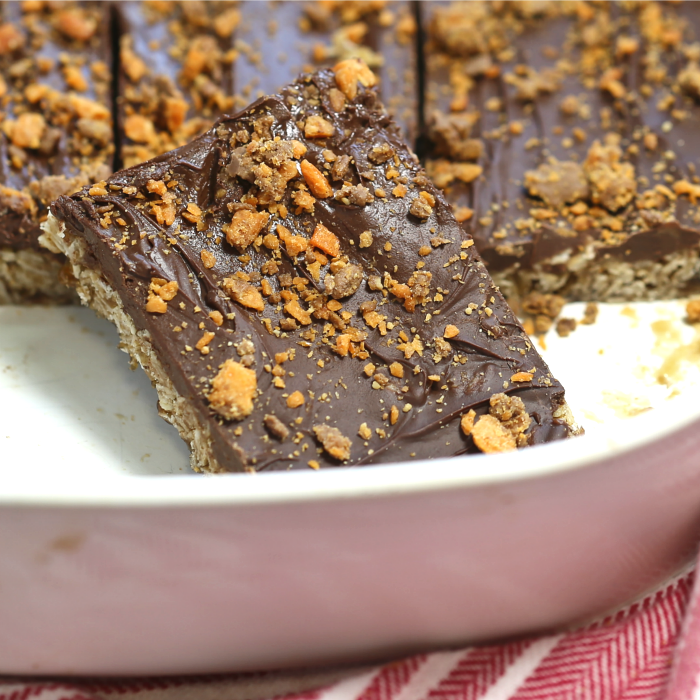 Do you love bars and slices as much as I do? Try one of these recipes, too. 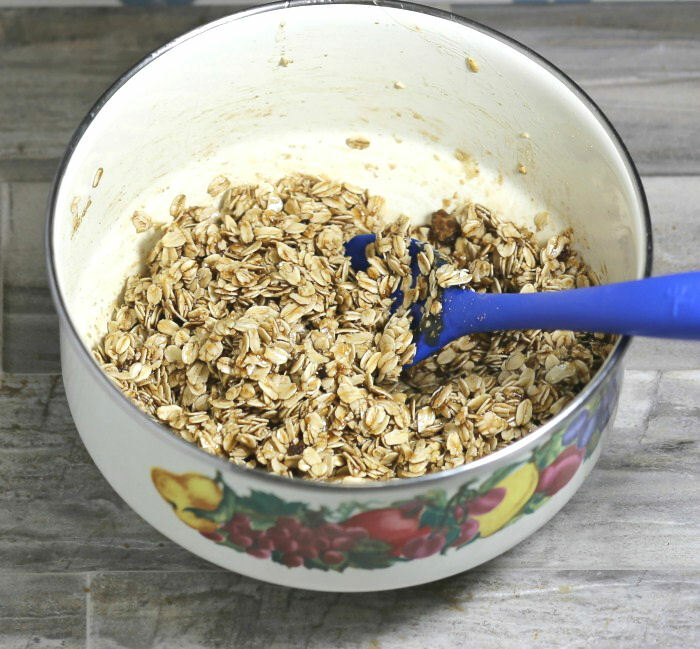 Need a reminder of this microwave oatmeal bar recipe? 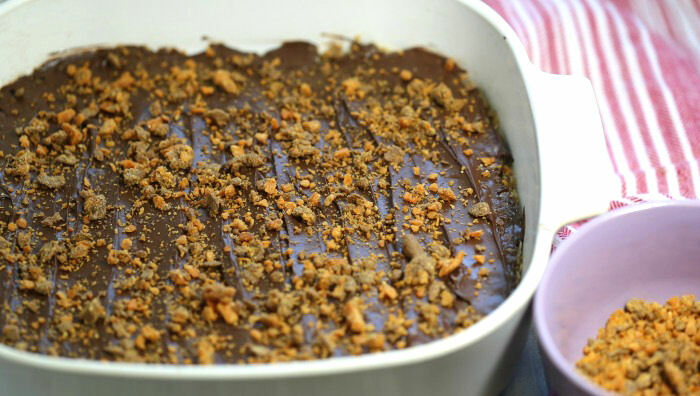 Just pin this photo to one of your Pinterest baking board for easy access later. These microwave oatmeal bars have just six ingredients and are made in the microwave so that the kitchen stays cool. Grease a 9" square microwave proof baking dish and set aside. 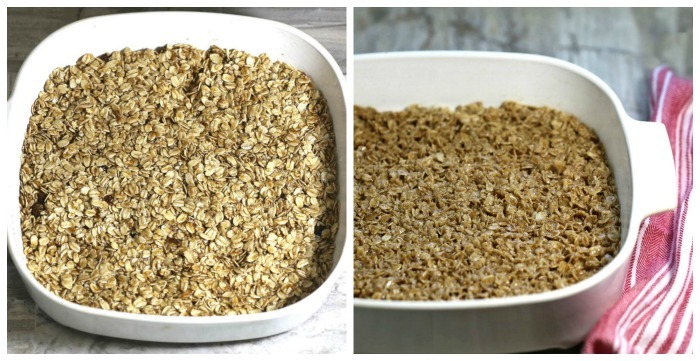 Combine the oats and brown sugar in a bowl and mix well. 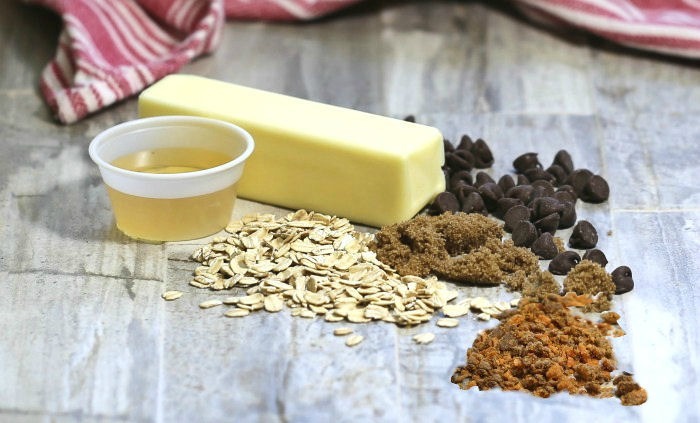 Melt the butter in the microwave for 1 minute and add it and the corn syrup to the oats and brown sugar. Combine well and press into the prepared pan. Microwave the pan, uncovered, for 1 1/2 minutes. Let it rest about 10 seconds and heat again for another 1 1/2 minutes. Sprinkle the chocolate chips over the top of the base and heat on 30% power for 4 1/2 minutes. Spread the chocolate over the base evenly and sprinkle with the Butterscotch baking bits. Place in the fridge for an hour to allow the chocolate to set and the base to firm up.